Finished up the joints for the remaining seats this weekend. 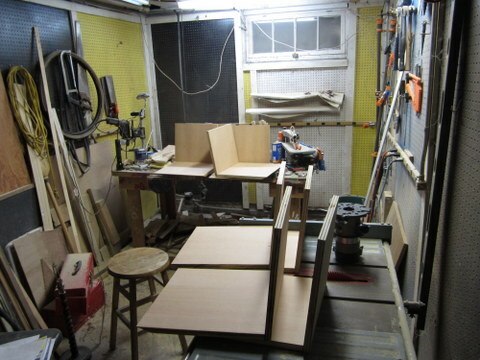 Ellen didn’t think I was giving an honest portrayal of the working conditions in my shop, so here’s a full view, showing all eight seats in situ. I’m relieved to have finished these joints, probably one of the more exacting tasks in this project. The joints came out pretty well, with only some small gaps (< 1/32") visible on the exterior. I should be able to close most of those up with a little more filing and chiseling, but for now I want to move on to something else. Next up: I have a mind to try a pair of sliding dovetails inside the acute bends. This entry was posted in All on 2013-09-29 by Mike Sokolov.